Gross Area: 139,000 sq. ft.
Area Per Student: 126 sq. ft.
Nice projects. 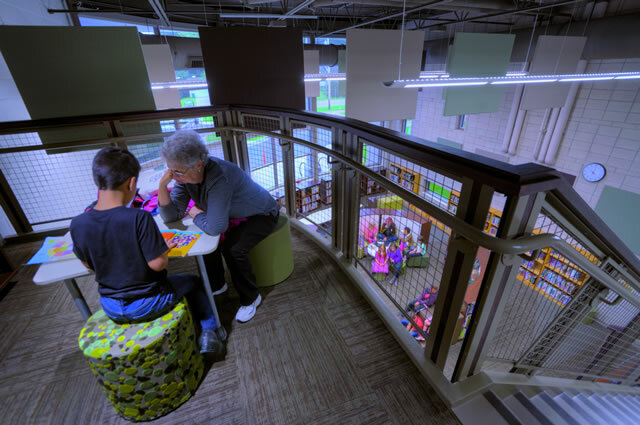 The renovation/ rebuilding planning and design did a good job of creating welcoming spaces, while increasing security and providing flexible learning areas and even nice playgrounds. Spring Lake Public Schools is a small grade K-12 district in western Michigan surrounded on three sides by bodies of water, including Spring Lake and the Grand River. The district’s two grade K-4 elementary schools serve over 850 students combined. Holmes Elementary is located in the “downtown” area of the Village close to the district’s Intermediate/Middle School. Jeffers Elementary School is more remote, about three miles from the downtown area. 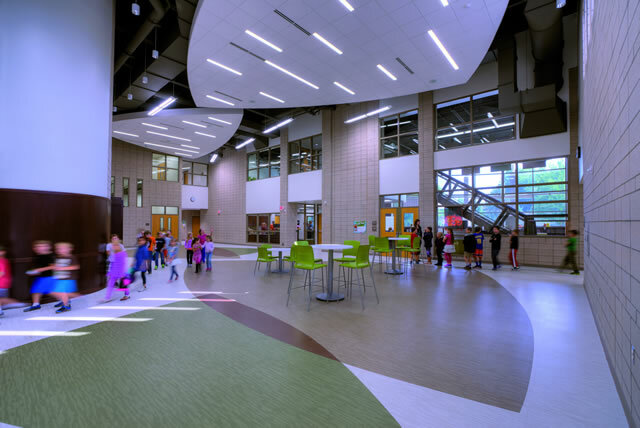 A 2014 Bond Program was approved by community voters, and challenged designers to completely transform both elementary schools, to bring them up to current educational standards and beyond, while they maintained the tradition of the existing historical buildings. After conducting extensive vision planning sessions with staff, students, parents, and community members, it was decided that a quarter of each existing building was to be preserved and remodeled as new pre-school areas. 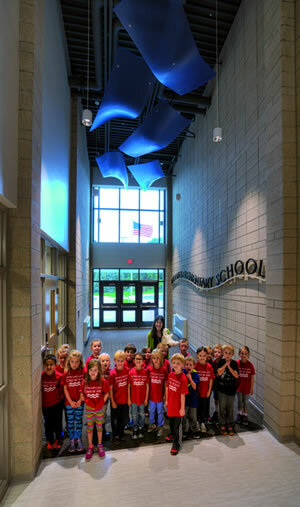 The new sections of the buildings were to be dedicated to 1st through 4th grade classrooms, a new Welcome Center/Offices, and new Cafeteria, Gymnasium, Media Center, Collaboration Studio and Commons. 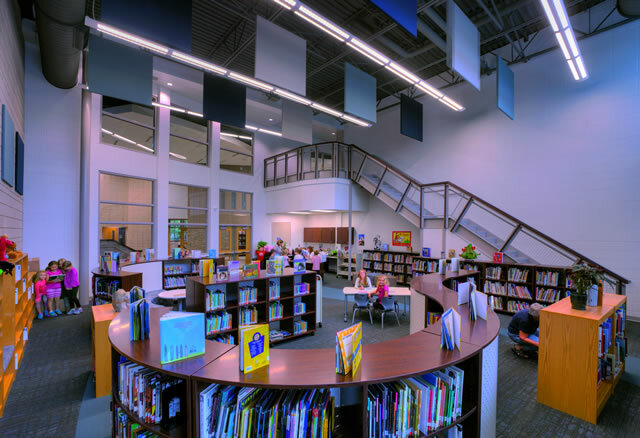 The main focal point of both “new” elementary schools is the dynamic Commons Area that organizes all school functions that surround it. 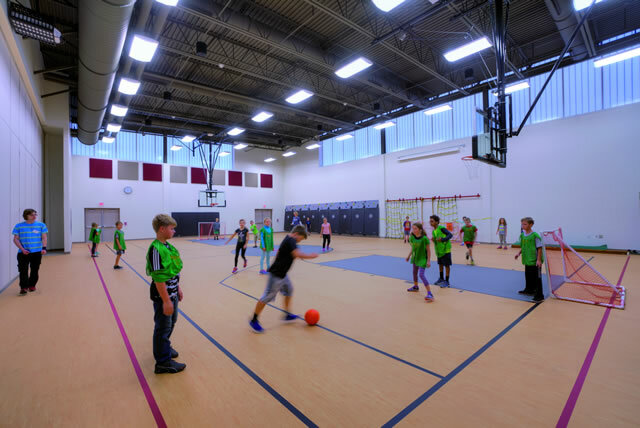 From its centralized location students can easily access the remodeled Pre-School area, a new two-story Classroom Wing, and the Cafeteria, Gymnasium, Offices and Media Center. A feature wall opposite the main entry showcases historic items from the school’s past, and a large monitor displays daily announcements. On the second floor, and directly connected to the first floor Media Center by a separate stair, a shared and spacious Collaboration Studio provides a 21st Century learning environment. Both the Studio and Media Center are equipped with flexible furniture that offers opportunities for various configurations to support a variety of functions. During school hours, student and visitor traffic flows through a new safe and secure entry. The reception area within the Office acts as a Welcome Center, controlling access to the building, and supporting “friendly supervision” with ample windows between the Administration area and busy Commons. The Cafeteria is centrally located with a stage on one end and tall windows overlooking lush forested outdoor views on the opposite side. The room can expand to include the adjacent Gymnasium through an operable wall. This arrangement allows the school to organize events from 200 people seated within the cafeteria space to over 600 within both spaces. Designers established sustainable goals for both projects early in the process. 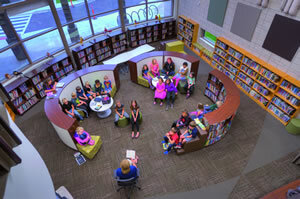 In addition, it was important for the district and for each elementary community that the historic and unique character of each building was preserved. 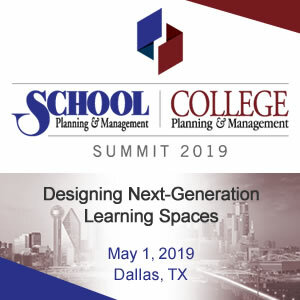 Sustainable design principles and goals resulted in abundant natural controlled daylight, recyclable and low-VOC materials throughout each school, efficient HVAC and lighting systems, and special features such as a greenhouse and outdoor learning opportunities. In order for both schools to have equal amenities, yet possess their own unique character, TMP turned to the history and location of the buildings for inspiration. As part of the downtown campus, Holmes Elementary School is adjacent to the Grand River. Therefore, “water and the shore” became the theme for this school, reflected in color palettes, finish selections and furniture colors. The feature wall in the Commons Area was built with stone, which honors and recalls the historic entry of the old Holmes School. Jeffers Elementary is located on the outskirts of the village in a wooded area. The theme selected for Jeffers was “the forest” which is also reflected in color palettes, finishes and furniture colors. In this case the feature wall in the Commons Area was constructed of dark wood, relating to the dense forest that surrounds the adjacent playfields. 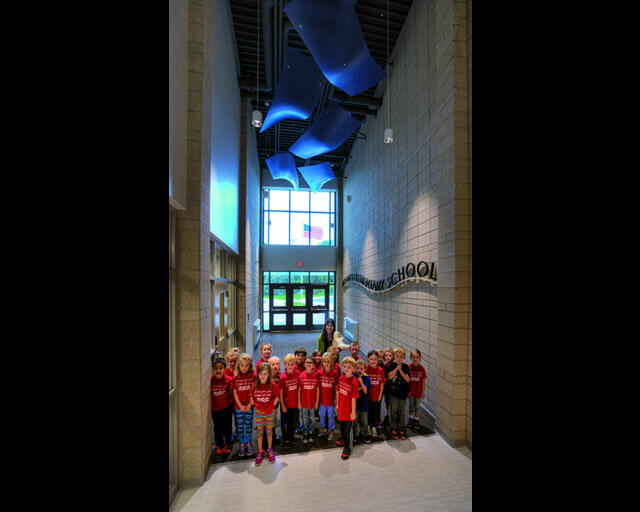 The design of the schools’ Commons areas ceilings and floor patterns were inspired by organic triangular shapes that resemble boat sails and tree leaves, connecting to the water and forest themes. Classrooms along the two-story grade 1-4 educational wing were designed with 21st century teaching pedagogies in mind. They are versatile and adaptable, supported by flexible furniture and a collaboration station between each classroom pair. 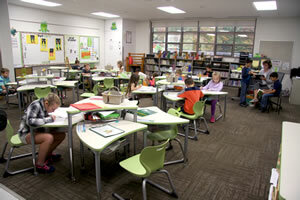 Movable instructor’s desks and student stations allow teachers to configure their rooms in multiple ways. Both buildings’ exterior design is similar yet unique in important ways. 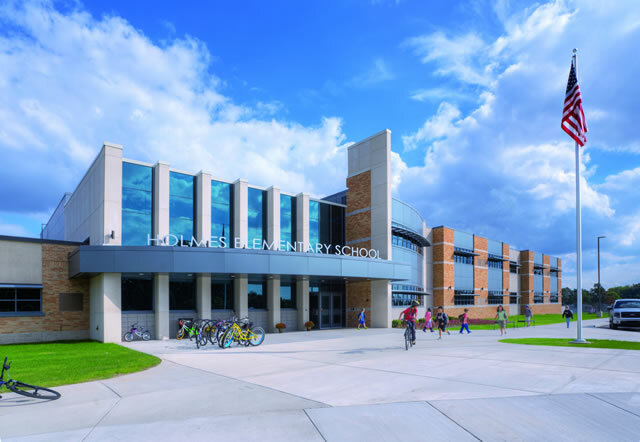 By utilizing the same components, like brick, CMU, limestone and insulated metal panels, but in different ways, each school maintains its identity. The differentiated color palette and the type of brick match the existing schools, and are consistent with the overall themes for Holmes and Jeffers. Both buildings are similar in size, with Jeffers slightly smaller at 69,000 SF (Renovation 17,000 SF/ New 52,000 SF). 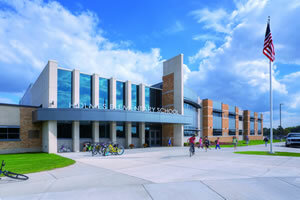 Holmes stands at 70,000 SF (Renovation 19,000 SF/ New 51,000 SF). 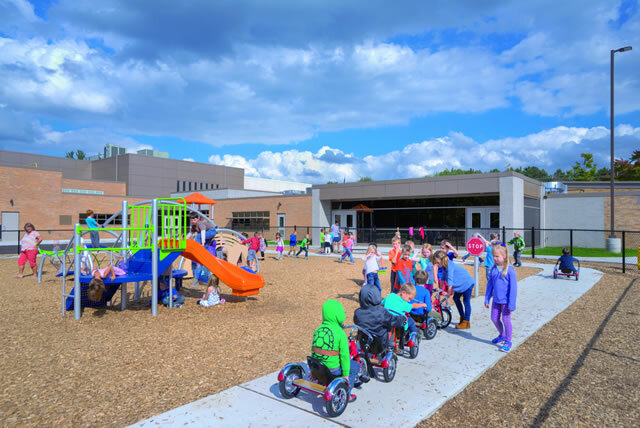 Both schools offer differentiated playgrounds by age, including hard surface play areas, green playfields, and outdoor learning areas. New bus and auto loops were developed to improve efficiency during pick-up / drop-off times. Seamless wireless access to technology is provided throughout each building.